We are back for another DIY Tuesday! This time we are showing you how to make your own after practice soak. It relaxes your sore muscles and nourishes your skin after a rough practice or bout. These are the basic ingredients and a few optional add-ons: I bought Magnesium Chloride on the internet. The Epsom salt, dry milk powder and most of the optional ingredients can be bought at local grocery stores. All others can be found at health food stores. 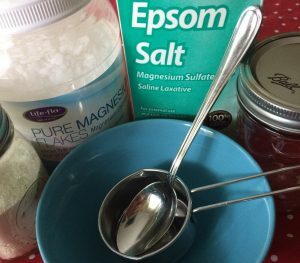 If you don’t have Magnesium Chloride but need a relaxing bath NOW, skip it and use sea salt and/or baking soda instead. If you like to avoid animal products feel free to skip the milk powder. a few drops of food coloring just for fun. *A fun and natural way to color your bathwater would be to use dried beetroot powder. Add about 1/2 to 1 cup to your bath water and RELAX. Stay tuned for more derby inspired DIYs and helpful hints brought to you by the Bout Betties team. We wanted to remind you that this blog post contains opinions of the writer and is meant to be a learning tool. Take the opinions we provide and do some more research to find the best fit for you. No money is being made from this post, there are no paid advertisements included.